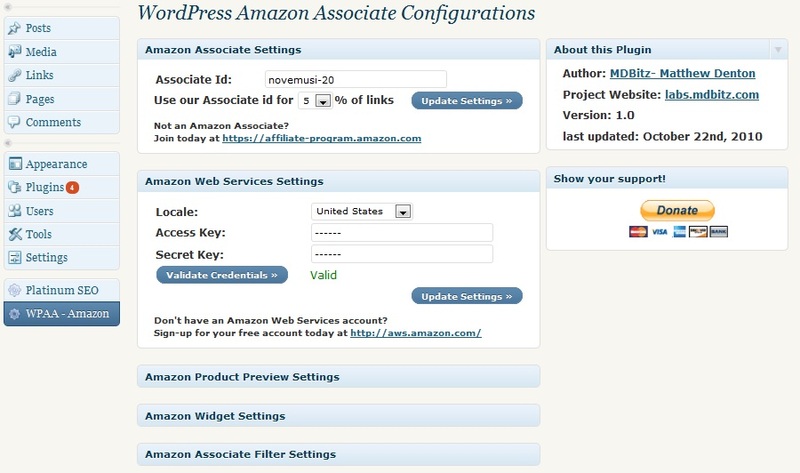 The WP Amazon Associate plugin is designed to give you full administrative control over all of its features. The WPAA – Amazon admin page is built with segregated control panels for each feature allowing you to quickly and easily update the plugin with your desired settings. Download and install the latest version of the WPAA plugin today to easily enhance your WordPress website with integrated Amazon Associate support. Would you please explain exactly were I will find my Access Key and Secret Key to enable me to use the WPAA plugin. Amazon Access and Secret Keys are part of Amazon Web Services and not the Amazon Affiliate program. To utilize the plugin to insert product links you will need to create an account at http://aws.amazon.com/. Once you have an account navigate to Account > Security Credentials and you will find the Access and Secret Key. The plugin requires this access to utilize the Amazon Product Advertising API to return product images and information used by the plugin. Without these access keys you will only be able to insert widgets through the plugin.